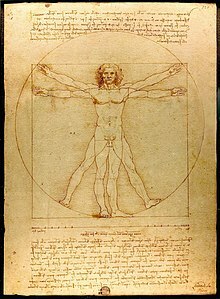 Vitruvian Man le Leonardo Da Vinci. Bha buaidh mhòr bho na sgrìobairean airson an ath-bheòthachaidh. B’e an t-ath-bheòthachadh linn ann an eachdraidh na h-Eòrpa, eadar na Meadhan-Aoisean agus An t-Ath-Leasachadh, nuair a bha flùrachadh den ealain, eòlas, 7c. Thòisich e anns an Eadailt. Air a tharraing à "https://gd.wikipedia.org/w/index.php?title=Linn_an_Ath-bheòthachaidh&oldid=523866"
Chaidh an duilleag seo a dheasachadh 20 dhen t-Samhain 2016 aig 09:35 turas mu dheireadh.